There were keen bidders queueing at the door to our viewing rooms for our 19th September Die Cast, Model Soldiers and Toys Auction. There were 305 lots offered in this section. 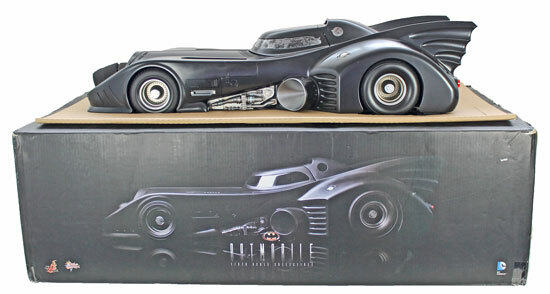 We began with the named toys section and this Hot Toys 1:6 scale 1990s Batmobile Collector’s Edition which realised £660. 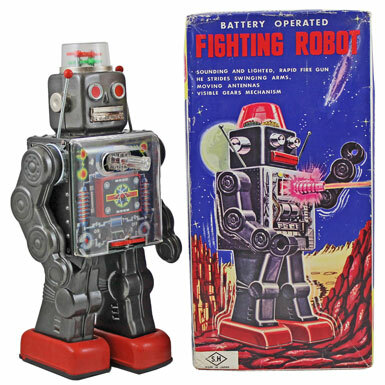 This unusual SH (Japan) 1960s Horikawa tinplate and plastic battery operated ‘Fighting Robot’ sold for £252. 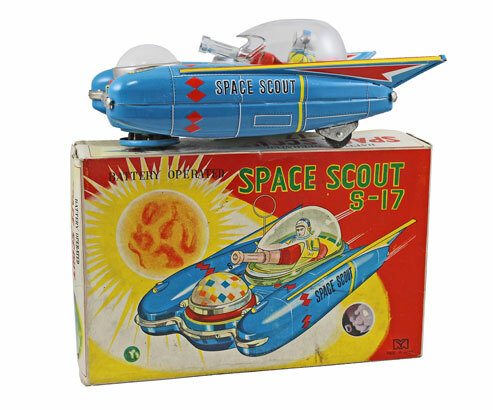 This Y Toys (Japan) tinplate ‘Space Scout S-17’ battery operated vehicle achieved £252. 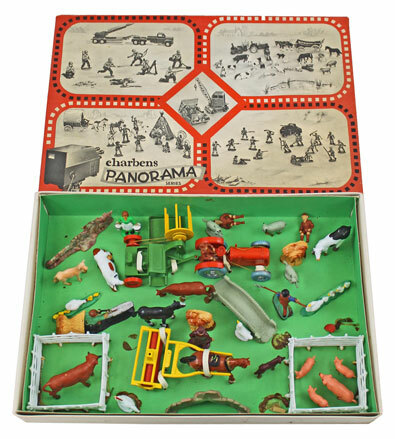 And this Charbens Panorama series Farm Set No. 329 realised £240. 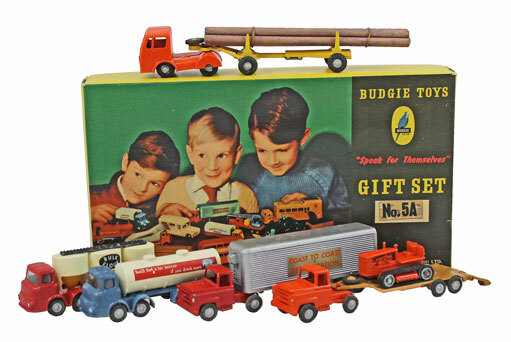 Moving onto the die cast section of the auction, this Budgie Toys Gift Set no. 5A sold for £192. In the Corgi section this James Bond’s Aston Martin DB5 no. 270 achieved £144. This Batman Gift Set no. GS3 realised £360, three times its original estimate! 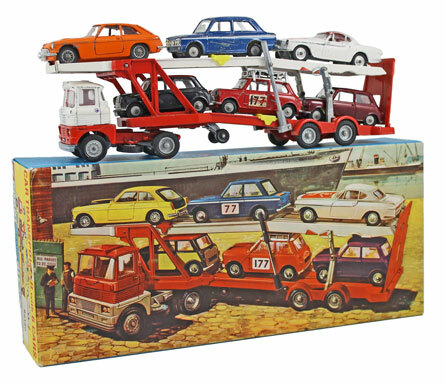 And this Carrimore Car Transporter with Scammell Cab Gift Set no. 48 sold for £396. 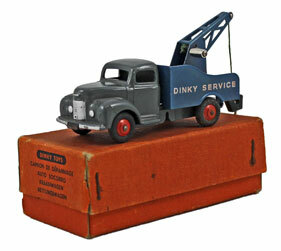 In the Dinky section highlights included this Commer Breakdown Lorry no. 25X which achieved £168. 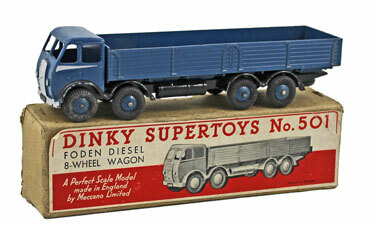 This Foden Diesel 8-Wheel Wagon no. 501 realised £120. 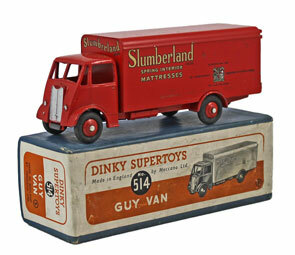 And this Guy Van Slumberland no. 514 sold for £156. 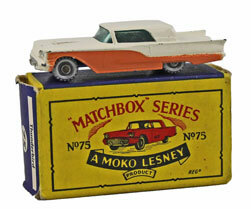 This unusual Matchbox Ford Thunderbird no. 75a with cream body and peach side panels achieved £72. 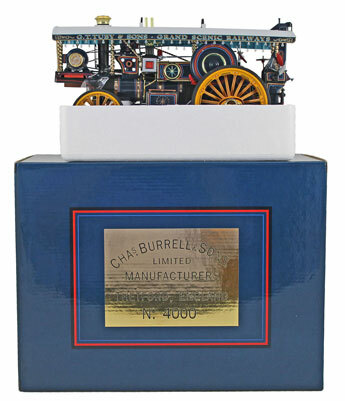 And this Midsummer Models 2012 1:24 scale Burrell Scenic Showman’s Engine Ex Mayor no. MSM007 realised £192. Our next die cast, model soldiers and toys auction will be held on Wednesday 21st November 2018. The full catalogue for this sale will be on our website in the next few weeks or keep an eye on our Twitter and Facebook pages which will include updates of our latest auction news.